If you've been missing The Cherry Tomato in Queensbury since it closed for the winter, then here's some news that might catch the attention of your taste buds. 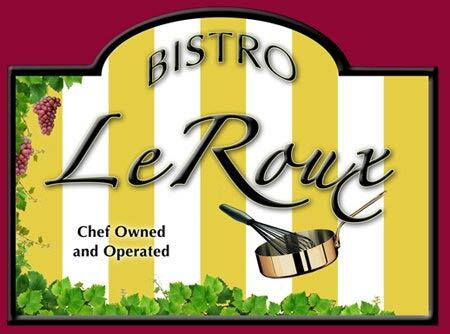 As of Tuesday, June 15, 2010, the location will reopen as Bistro LeRoux, a chef-owned and operated restaurant with a strong base in French cuisine. The new menu includes pasta, steak, and seafood dishes, all made to mouthwatering perfection. In addition, the dessert menu offers a concise but sinfully tempting array of after-dinner satisfaction. The restaurant is owned and opereated by the Guay family. Bob Guay bought the establishment with the hope that it would bring his son and daughter-in-law, Executive Chefs Jacob and Tiffany Guay, to come closer to home. The name "Bistro LeRoux" comes in part from Guay's mother's maiden name. It is also the name of a thickening agent used in French cooking. The contributions of the Guay family have lent to the business's family-owned charm, chef-operated pride, and fine dining sophistication. Bistro LeRoux is located near the intersection of Route 149 and Bay Street. For reservations and more information, call 518-798-2982 - and have a taste for yourself! Read about more news in the Glens Falls Region!